Shelters vary greatly from luxury barns that look like people could live in, to three sided shelters costing less than $200 to construct. Alpacas need shelter from the wind and rain and sun if you don't have a lot of tree coverage. It doesn't need to be that warm or air tight ‐ just dry. Inexpensive shelters can be constructed using some simple materials such as 2X4, plywood, and plastic corrugated roofing for about $175 each. Car ports with sides are also effectively used. 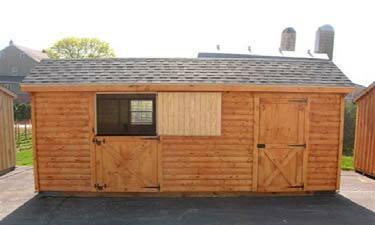 Alpacas adapt well to old barns too ‐ just as long as any dangerous objects are removed. Alpacas have a thick and efficiently insulating fleece that keeps them warm throughout the cold weather. They can even be left out all winter – remember they are used to the snow in the Andes – but they do like some shelter from the wind. 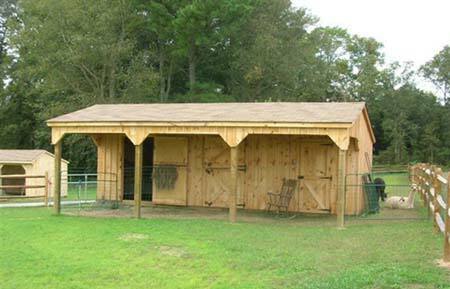 If you are designing a barn from scratch, consider having stalls that open out to a small paddock under an overhang, and then another gate out to a pasture. This multi‐tiered approach will allow you the greatest flexibility for caring for and showing off your alpacas to visitors. Alpacas do better with corral panel stalls where they can see one another. There are many different options for housing your alpacas. The main thing to remember is to give them protected from the wind and sun. If you intend to breed alpacas, you should anticipate a need for at least three, or even, four pastures. The first will house your females, the second is for adult males, the third is for weanlings, and if you have the room and money for fencing, the fourth can house your young males that need to be isolated from the females, but are too young to go in with the older males who may bully them. Optimally, it would be best to have extra pastures to rotate your animals on, so that pastures can have time to recuperate and to prevent overgrazing. Obviously, money and space will determine what is best for your farm and animals. While fencing is constructed to keep the alpacas in a designated area, breeders cannot ignore the reality of threats from predators such as dogs, coyote, bears, and/or wolves. Many of the farms in our state have experienced injuries or even death of an alpaca from either the "dog next door", or stray dogs. The main focus on fencing should be to keep out predators. A non‐climb fencing is 5 feet tall, and very sturdy. Two electrified wires run along the outer perimeter at 6 inches and 24 inches above the ground. These wires are there to prevent a predator from either digging under or climbing over. The small spacing between the fence wires, 2 inches by 4 inches, helps protect animals from getting their legs or necks caught. It also makes it more difficult to climb. It is recommended that the non‐climb fence be woven fencing as opposed to welded. The woven fence is sturdier and will last much longer, but, of course, costs a lot more. Occasionally you will hear about an alpaca getting caught in traditional cow or field fencing. By cow fence, we mean the woven wire that is 4 feet tall and has smaller holes on the bottom, gradually getting larger to 6 by 8 inch spaces as you move up to the top of the fence. 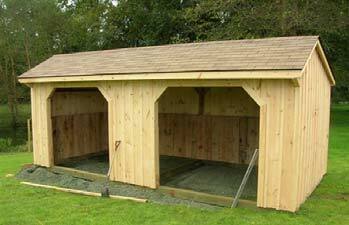 These spaces are large enough for the alpacas to put their heads through. Their long necks allow them to stick their head back through another hole and they are trapped. Avoid using this type of fencing. Catch areas, about seven feet square, in the corners of fields are helpful for managing the stock. The rule of thumb for pasturing alpacas is six alpacas per acre depending upon the pasture quality.